An Iranian diplomat held hostage in Yemen for more than 18 months has been freed following an intelligence operation, Iranian state media say. 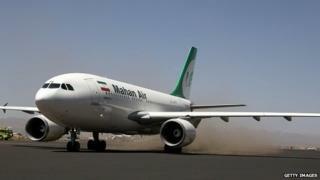 Nour Ahmad Nikbakht was greeted by officials and tearful relatives at Tehran's Mehrabad Airport on Thursday. It was not immediately clear if Mr Nikbakht was freed in an armed raid. A deputy foreign minister only said that he had been rescued "from the clutches of terrorists in a series of complex and difficult operations". Mr Nikbakht is the second high-profile hostage to be freed in Yemen in a week. Saudi diplomat Abdullah al-Khalidi was released on Monday after being held by al-Qaeda in the Arabian Peninsula (AQAP) since March 2012. Mr Nikbakht was abducted in Yemen's capital, Sanaa, in July 2013. Armed men stopped his car, forced him into their vehicle and sped away before security forces reached the area. "I was kidnapped by unknown gunmen and terrorists as I left my home to go to work," he told Iranian state television on Thursday. "I was in an extremely difficult situation and I did not know what was happening in the outside world," he added. No group claimed responsibility for Mr Nikbakht's abduction, but Yemeni tribal and security sources told the AFP news agency that he was held by AQAP militants in a remote area between the southern provinces of Shabwa and Bayda. Ahead of his release on Monday, Iranian officials said that the diplomat was in good health. At one point in late January it was feared that he had been beheaded. Intelligence Minister Mahmoud Alavi told the official Irna news agency that the Iranian government had "refused the conditions set by the terrorists" for Mr Nikbakht's release, suggesting there had been negotiations. The operation to free him was carried out "with the fewest possible casualties," he added. Deputy Foreign Minister Hossein Amir-Abdollahian was quoted as saying: "A special team from the intelligence ministry was able to free Nikbakht from the clutches of terrorists in a series of complex and difficult operations in a very particular part of Yemen." Mr Amir-Abdollahian did not provide further details. In January, another Iranian diplomat based in Sanaa, economic attache Ali Asghar Assadi, was shot dead after resisting a kidnapping attempt. The previous month, two Yemenis were killed in a bomb attack by AQAP militants on the Iranian ambassador's residence in the capital. Iran supports the Shia-led Houthi rebel movement, which overran Sanaa in September and declared that they had taken over the country and disbanded parliament in January. The Houthis have also moved into southern and eastern areas dominated by AQAP, which has vowed to confront the rebels in defence of Sunnis.